Monday, July 18, 2011 – Our incredible special guest is Dr. 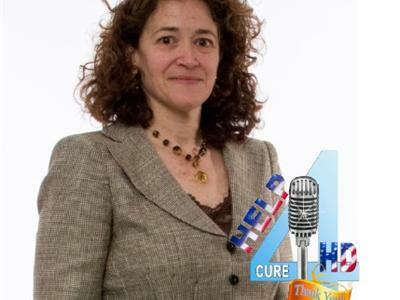 Merit Cudkowicz who is the Julieanne Dorn Professor of Neurology at Harvard Medical School. Dr. Cudkowicz's research and clinical activities are dedicated to the study and treatment of patients with Huntington's Disease and amyotrophic lateral sclerosis. Dr. Cudkowicz directs the Massachusetts General Hospital Neurology Clinical Trials Unit and is the Principal investigator of the Phase 3, 2 CARE clinical trial of Coenzyme Q10 in people with HD. She is an active member of the Huntington Study Group (HSG) and has pioneered clinical trials of new therapies for people with HD and other neurodegenerative disorders. In conjunction with the HSG consortium, she is a pioneer in promoting and developing more efficient methods of testing new therapies in people with HD.